If you take a look at the back side of your vintage Certina, you'll see (at least if it is from the 1950s to the mid-seventies, and the case back has not been polished) two numbers on the case back. These are the reference number and the serial number. There were three different systems of numbering, depending on the era. 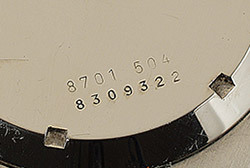 Prior to 1958, a reference number, for example, looks like this: 8600-2. But the composition of the reference number was similar to the following system which was used from about 1958 to 1974. Then, the system was changed again. It's not clear if the serial numbering was changed in the fifties. It also could be that it continued until the changeover in 1974. Furthermore, it seems that special watches, such as chronometers and gold watches, may have had a separate six-digit numbering. A reference number from the period 1958 to 1974 has two parts and seven digits. The serial number also has seven digits. The first two digits indicate the movement that was used. In this example, the 87 stands for the Certina 29-064 (Valjoux 728). The corresponding assignment can be seen in the tables below. 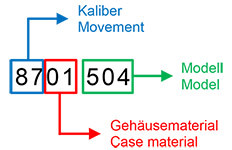 The second two digits represent the case material. Here we have a number 01 for a steel case. The last three digits indicate the appropriate model resp. the case style. In this case, the Chronolympic "Regatta" Chronograph. Please note that the following tables are still under construction and I cannot guarantee the accuracy and completeness of the information. Have you ever wondered what year your vintage Certina is? There are a lot of requests about that information. Unfortunately, until recently, there wasn’t a reliable way to check the serial number with the year of production. Even at Certina itself, it seems that no reliable records exist (based on various requests from collectors directly to Certina, in my experience). What luck for us vintage Certina aficionados that Martin Lovasz has taken it upon himself to prepare such a list, and also that he welcomes our participation. At this point, thanks again Martin for your work! The list published below cannot be absolutely guaranteed since it was created from various individual items. Unfortunately, the exact year can only be determined by a few elements. It takes a personal engraving or proof of purchase to determine the exact year. The more such pieces can be added to the database, the more precise the list will be. We are therefore dependent upon your help. So if you own a timepiece which can be clearly dated, please send me the data. I will then pass the information on to Martin. 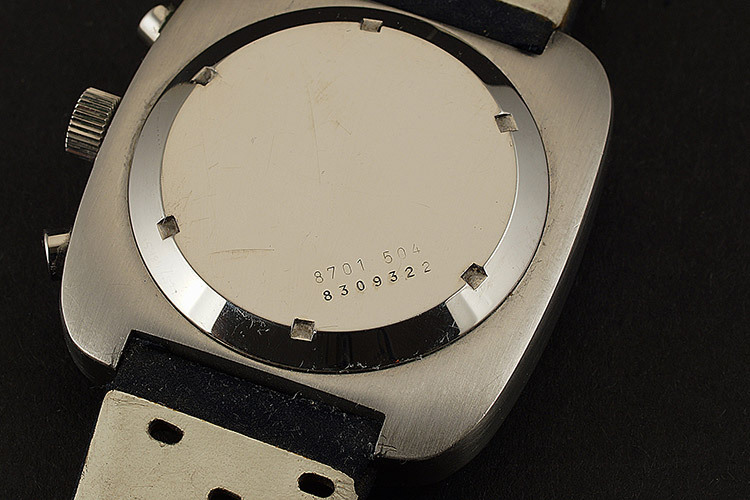 After the changeover in 1974 the watches had no more serial numbers. Using this list, you can roughly date your gold watch. But it is still very imprecise. A rough estimate of the production period can also be done by the various design markings on the dial. Until about 1953, the Certina writing on the dial was printed in cursive handwriting, with connected letters. The name "Certina" is taken from the Latin "certus", meaning "assured", "certain". Starting in 1954, the modern lettering with block letters in capitals was used, as it is today. In 1958, the lettering was complemented by the well-known logo with the two rotating “C” shapes, one within the other. In order to find a suitable logo, there was a competition created for graphic designers.